VX38234 VEAL, ERNEST STEPHEN. Submitted by Margaret Blaker (daughter). 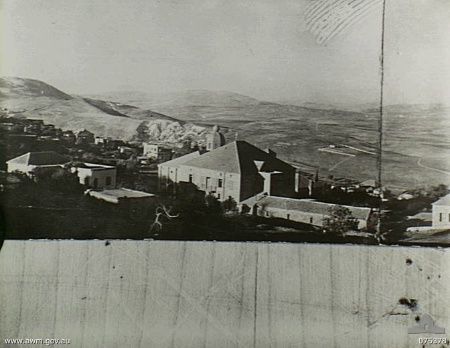 Background : The following is the text of an address given during the Annual Pilgrimage of the 2/2nd Pioneer Battalion, inside the Melbourne Shrine of Remembrance on Sunday 15th June 2008, by Margaret Blaker, whose father was a member of the Battalion. 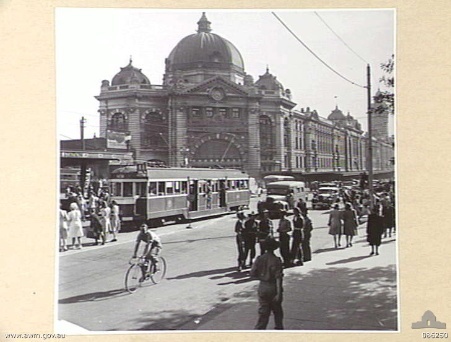 Until 12th August 1940, my dad had been a bus driver on the Footscray Sunshine Service. He discussed the security situation with my mother and his opinion was that it was his duty to enlist. The sooner, to engage the enemy "Over There" rather than to wait to fight them in Australia. He enlisted at the Melbourne Town Hall on 12th August 1940. He thought he could be a dispatch rider as he had competed in Scrambles with the Footscray Motor Cycle Club. The Army authorities thought otherwise. He had been brought up in the Salvation Army, where he played in the brass band, so the Army gave him a bugle to play. 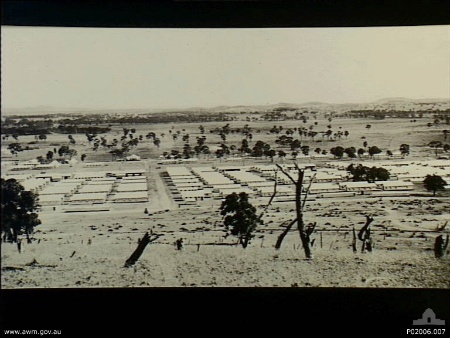 I remember at Puckapunyal Camp, Seymour, Victoria, Dad took me when he had a bugle call to make. He stood with George Smart and Geoff Gee to sound the call. It was very loud ... I ran away. Dad had to finish the call before going to look for me though the rows of huts. He found me. I am here today! He held an endorsed licence as a bus driver so he was allocated a truck to drive. On leave, dad drove us to George Smart's flower farm at Notting Hill. I had only ever seen flowers in a garden until then. After training at Puckapunyal and Balcombe Camp, Mt. 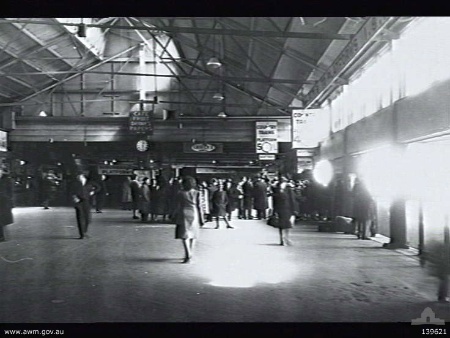 Martha, Victoria, the Pioneers left Spencer Street Railway Station for Sydney. We waved them "Goodbye". They sailed from Sydney in HMT.NN or as we know it, the Queen Mary. 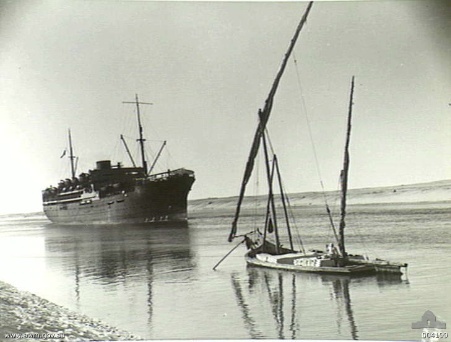 They disembarked at Port Tewfik and proceeded up the Suez Canal in the S. S. Ethiopia, and then by train to Gaza. They moved north to action in Syria, or more correctly, Lebanon. I received a cable from Dad in Syria for my 4th birthday, June 15th 1941. The battle for Merdjayoun was in progress. 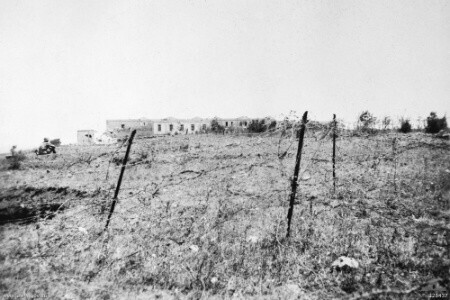 The Vichy French had just retaken the Fort Merdjayoun. Our men regrouped to counter attack. Private George Smart was a medical orderly, as well as a bugler. He was kept busy near the front line rendering first aid to up to 30 men at once. Later George was injured and returned to Australia from Syria. Dad had a bout of malaria and was hospitalized. After his recovery he drove Major Ed "Weary" Dunlop around for three weeks scrounging equipment to build a mobile hospital so the medical staff could stay with the troops. 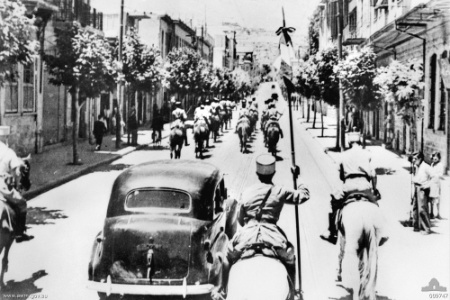 In Greece, Allied hospitals had fallen to the Germans. Once, Dad was detailed to a job and Major Dunlop had him recalled to help bring in the wounded. Dad had heard of the road to Damascus at Sunday school, but he now experienced the GOAT TRACKS over the hills. After the war ended, a Pioneer greeted Dad on Flinders Street Railway Station, shook his hand sincerely, then told my mother and me how well Dad had driven him over the goat tracks when he was badly wounded. Early in the battle, Sergeant Norrie Dike was killed in action. Mum had met Mrs. Dike at the Ladies' Auxiliary. Mum and I went to visit Mrs. Dike and her son in East Coburg. On the tram from St. Kilda, Mum told me of their grief. I then realized, at four years of age, the danger all of our Daddies were in. When we arrived, we children were sent outside to play while the ladies talked. 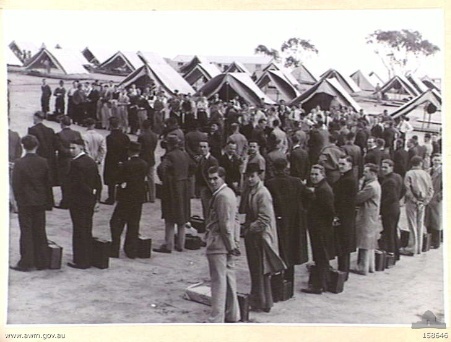 After the Syrian Campaign the men embarked on the Orcades to return to Australia. They were diverted to Java. The troops were disembarked to make room for women and children fleeing ahead of the Japs. We waited at home for letters from Dad - none came! Mum got quite teary, the family doctor told her to get a job. She joined the W.A.A.F. I stayed with Dad's mother and later with Mum's mother. The troops were captured by the Japanese in Java where Dad spent most of his time as a P.O.W. At this time Geoff Gee, Dad's friend and fellow bugler died. Later Dad was transported to Singapore. Tin and rubber had melted when the allies bombed the warehouses. Our troops had to shovel it off the wharves. The Japs wanted the rubber and tin for their war equipment. Dad developed a hernia which became infected after an operation by the Changi Medical unit. At the end of the war, penicillin was flown in. The doctors read the instructions on the new drug. It saved Dad until he returned to 115 Heidelberg Hospital. The war in the Pacific ended on 14th August 1945. We were notified through a list in the Sun Newspaper on September 15th. It was my Aunt's wedding day. 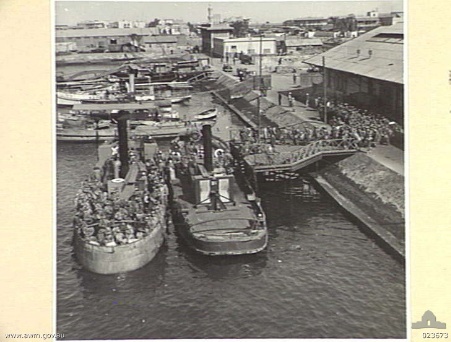 The men returned in the hospital ship Oranje. The men disembarked. The walking wounded to cars, the stretcher cases to ambulances with the doors pinned back so the men could see out, OR with the doors closed if they were too ill. The people of Melbourne lined the streets from Port Melbourne to Heidelberg. I saw Dad in the 3rd Ambulance with the doors open. We hurried to Uncle Jack's car to catch up with the ambulance. We parked near where the Arts Centre is now. Up until then I was the only family member to see Dad. There he was... on the left upper stretcher. Back to the car and we hurried to Clifton Hill. The railway gates closed so we ran to greet Dad. The Driver told Mum and me to hop in. Uncle Jack followed in his car. The men were fed as much food as they could eat. A stack of six empty plates on a bed trolley was the norm as the men regained strength. After Dad was operated on, the surgeon told mum that despite the horrific condition of Dad's wound he had done his best, and now it was "Up to God and Ernie's will to live". Dad was proud that Mum was now a sergeant in the WAAF, and as such she could enter the hospital and sit beside him all day as she had special leave. VX38234 Private E. S. Veal was discharged on 28th February 1946. He went back to work at his previous employment, and family life continued with six more children. "Hap" was his nickname as he whistled all day. Dad had suffered with malaria and beriberi during the war and developed Parkinson's Disease in 1954. He died on 30th June 1983. His positive attitude was admirable throughout his life.